Many people need to read news from more than one server. For example, they might use a company news server at work, and their ISP's at home, or connect to news servers provided by companies which have a small set of groups dedicated to product support and information exchange. With MT-NewsWatcher, you can read news from several news servers at the same time, or use different servers in different situations, without having to start from a different preferences file. Using the News Servers item in the Special menu to bring up the News Servers dialog, you can create up to 24 different servers and set various configuration options for each one. Each User Groups window is then associated with one of the servers you have created; any group opened from that user group list is opened on the specified server, and messages that you post when reading news from that server is also posted to the same server. So to read one set of groups from one server, and a second set of groups from another server, you need to make two User Group Lists, one for each server. Normally, you'd read different sets of groups from different servers. If you wish to read the same group on two servers, you have to add it to two different User Group lists. When you start up MT-NewsWatcher for the first time, it prompts you to enter the address of a news server, which will become your default news server. If you are upgrading from an older version of the program, the server specified in the preferences will become the default server. If you don't need to read news from a different server, then you have no need to create additional servers. You open a User Group list that was previously associated with a news server that the current settings do not have information for. You clicked on a news URL which specifies a server that you don't already have, for example news://news.mozilla.org. Open the News Servers dialog, using the News Servers item in the Special menu. You will see the dialog above. Click the New... button. A simple dialog comes up prompting you to enter a name for the server to be created. This name is simply a label that is used to identify the server to you, and does not have to be the server address. Server names must be unique; if you have typed a name that matches the name of an existing server, the OK button will be disabled. You must choose a different name. When you have entered a name, click the OK button. The server is created with some default values. Enter the address of the server in the box in the Server Options panel. This must be a valid internet address, like "news.mycompany.com". A raw IP address is also acceptable, for example "192.13.12.137". This is the only required information that you have to enter before using the new server. If you want to adjust more configuration options, see below. Once you are happy with the settings for the server you just created, click the OK button to dismiss the News Servers dialog. If you want to discard your changes, click the Cancel button. Note: If you cancel the news servers dialog, changed you made to any server while the dialog is up will be discarded. Tip: You can create more than one server at a time in the News Servers dialog. Just repeat the above steps for each additional server that you wish to create. Once you confirm the News Servers dialog, MT-NewsWatcher will attempt to connect to the new servers and, if successful, will fetch the full groups list for each one. If you are on a modem line, this could take some time; please be patient. Once this is complete, you'll see a Full Groups window for the each new server. Now you can create a new User Group list, using New User Group List in the File menu. In the new user group window, click the disclosure triangle (or type Command-H) to reveal the server selection popup, and choose the server you wish to associate with this window from the popup menu. Then find the groups you wish to subscribe to in the Full Groups window, and drag them over to the new User Group list. When you are done, save the User Group list using Save on the File menu. Information about which server is associated with the User Group list is saved with the file for that User Group list. When you open the list next time, the correct server is already specified. One news server is the default server. This server is used when no server is otherwise specified. For example, if you click on a news URL like news:comp.sys.mac.comm, MT-NewsWatcher will open the group comp.sys.mac.comm on your default server. 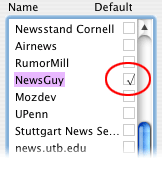 If you delete the default server, MT-NewsWatcher will set the default server to the first one in the list. Tip: To change the label for a news server, double-click the server name in this list. The name becomes editable; type the new name, then hit the Return key to finish editing. Note that this just changes the label for this server that you see in the menus and dialogs. It doesn't change the net address of the server. This section describes in detail what the various news server configuration options do. The settings are contained in three panels; you can switch between them using the tabs. Note that the tabs might look a little different for you if you are using Mac OS 10.2. This panel contains a number of options that control how MT-NewsWatcher communicates with the news server. This is the address of the news server. It can be either a fully qualified host name like "news.mycompany.com" or an IP address like 192.13.12.137". If you need to connect to a non-standard port for NNTP, you can enter the port number after the news server name and a colon, like "news.somecompany.com:11024". The standard NNTP port is 119. 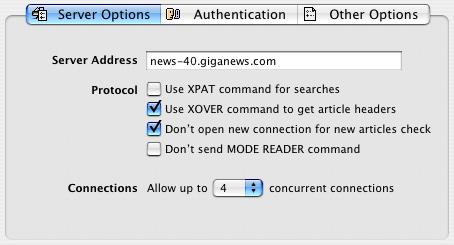 XPAT is a command that is sent to the news server when searching article headers. MT-NewsWatcher can use it when you do a Search News in the Special menu. When XPAT is turned on and you do a search, MT-NewsWatcher composes an XPAT search request, and sends that to the server. The server does the search, and sends back a list of matching articles, which MT-NewsWatcher then displays. When XPAT is turned off and you search, MT-NewsWatcher has to fetch all the headers for the groups being searched, and do the searching itself. This can involve much more network traffic. On some servers XPAT searching does not work properly, or at all. If you find that searching produces no results for a server, turn this option off and try again. By default, this option is turned on. When you open a news group, MT-NewsWatcher asks the server to send back a list of headers which contains the authors, subjects and other information about the news articles. The XOVER command allows MT-NewsWatcher to fetch all the headers for an article at once, rather than one header at a time. This can make opening groups faster. Sometimes a news server does not understand the XOVER command, or sends back badly formatted data in response. This might cause the headers for one or more articles in the subject list to appear garbled or missing. In these situations, you can turn off the use of XOVER to fall back on fetching headers the slow way (using the XHDR command). In addition, some servers fail to implement another related command (LIST overview.fmt) which MT-NewsWatcher uses to determine the format of XOVER responses. If this is the case, you'll see a dialog informing you of this fact and be given the option to turn off XOVER. Normally, you don't need to in this situation. Some older news servers fail to show any new articles in a group if the news client (MT-NewsWatcher) asks for this information using a connection which has been open for some time. 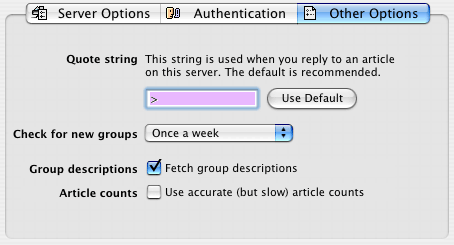 This setting tells MT-NewsWatcher to always start a new connection in this case, so that the server reports that new articles have arrived properly. For most servers, you should leave this option off. If you have automatic checking for new articles turned on, and no new articles are reported until you quit and restart, then you should turn this option on. The MODE READER command is used to tell the news server that the machine it is talking to is a news client (i.e., reader), rather than another news server. Some news servers have to receive this command before they will communicate properly with a news reader like MT-NewsWatcher, so MT-NewsWatcher sends this by default. Turning it off will make the initial connection to the news server slightly faster. MT-NewsWatcher can open several simultaneous connections to the same news server, so that it can fetch articles at the same time as fetching article headers, or extracting binaries. If you try to start more tasks than there are connections, then MT-NewsWatcher will queue up those tasks. You will see that the label for such tasks says "Waiting for connection" in the Tasks window. In order to reduce load on the server, you can limit the number of connections that MT-NewsWatcher will open using this setting. You may also want to keep the number of connections low if you are using a modem, and prefer to have fewer, faster connections rather than more slow ones. Some servers, particularly those used by subscription news services, can also limit you to a certain number of connections, often one or two. If that is the case, use this setting to ensure that you stay within this limit. This will prevent MT-NewsWatcher from trying to open additional connections which would be disallowed anyway. If you have a fast, direct connection and the server imposes no limit on the number of connections, you can set this option to 4. Otherwise, choose some lower figure as appropriate. You should avoid setting it unnecessarily high to reduce news server load. Some servers require that you log in with a username and password before you can use them; this is called authentication. They may also allow you to read news, but not post unless you log in. The options in this panel are used to control these options. To find out whether your news server requires authentication, contact your news server administrator or ISP. Use this popup to choose how to authenticate with the server. This will almost always be "Username and Password". If you use a news server which uses some kind of Kerberos authentication, one of the other two options may be available for you to use. In that case, contact your site administrator for more infomation. This is the username you enter when logging into the server. It might be the same as the username you enter for your email address or to log into other services. This is the password you use when logging into the server. When you type in this field, bullets (•) show up on screen, but MT-NewsWatcher stores the actual characters that you typed. You can leave this field blank. If you do, a password dialog will appear when you need to enter it. If this option is checked, then your password is stored in MT-NewsWatcher's preferences, in a simple encoded format. This is not very secure, but is enough to prevent some idly browsing your disk from seeing a plain text password. As mentioned above, some servers require authentication before you can read any news, or before you can post. 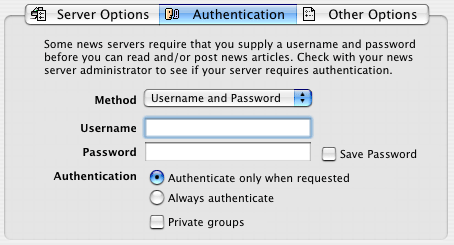 If you select the Always authenticate option, MT-NewsWatcher will send your username and password (prompting you to enter these if necessary) every time you connect to the server. If you select Authenticate when requested, MT-NewsWatcher only sends this information when you try to post an article. Some servers restrict certain newsgroups to people who have logged in with their user name and password. These groups are only visible to the news client after logging in. When this option is turned on, MT-NewsWatcher will re-fetch the full groups list after you change your username or password, so that such private groups show up. This quote string is used when you reply to articles on this server. It is the string that is prepended to each line of quoted text in your reply. This string is specified on a per-server basis, because some servers are configured to check for a certain amount of quoted text when you post a reply, and reject articles with too much quoted text in relation to new text. You can work around this by specifying here a different quote string, though this is not recommended. MT-NewsWatcher can check for new groups on the server when it first connects. This can slow the connection down slightly, so you can choose to check for new groups less frequently using this popup. Checking for new groups once per week is probably optimal. Group descriptions are one-line summaries of what each group is for. Because there are so many groups, this can be a lot of data, so might make downloading the full groups list take a long time. If you turn on fetching group descriptions, you should see them in the Full Groups window (make it wider). Some servers don't carry descriptions for some or any groups. It's common when you subscribe to high-traffic groups, like binary groups, to see group article counts that are shows as ">99999." However, when opening the group, you might find that MT-NewsWatcher only fetches say 30,000 articles. This is because the number of unread articles in the group is normally an estimate based on the first and last numbered articles that are present for that group, and article expiration and cancellation can lead to "holes" in the list of articles present. This option that addresses these problems. Checking this checkbox will activate accurate counts for this news server. When this is on, MT-NewsWatcher will fetch from the server the list of articles present for each group. This can slow down checking for new articles, but does not slow down other features. It uses that list to calculate exact counts of unread articles and, when you open the group specifying how many articles to fetch, to fetch exactly the number you specify. As described above, each User Group list is associated with a news server. If you click the disclosure triangle (or type Command-H), then an extra panel appears containing the servers popup menu. You use this to specify which server you want to read these groups from. Warning: If you try to change the server for a user group list, MT-NewsWatcher warns you that you will lose information about which articles you have read in those groups. If you choose to proceed, each group is reset to show the number of articles available on the new server. This cannot be undone. MT-NewsWatcher stores information about the selected news server with each user group list. If you open a user group list with missing server information, or with information about a server that has been deleted, the program will notify you. You can cancel the open operation, choose to open the groups on the default server, or create a new news server using the server information in the file. Note: If you have deleted and recreated a news server, or moved your User Groups list to another machine which is set up to access the same server, MT-NewsWatcher will notify you that an exact match could not be found when opening a User Group list. In this case, you can choose to open on the server that best matches the one the user group list was saved with, or on the default server. When you add a new server, MT-NewsWatcher downloads the full groups list for that server and stores it on disk, as described below. You can open a window to show the full groups list for any server using the Show Full Groups List submenu on the Windows menu. Double-clicking on a group in the full groups window will open that group on the server to which the window belongs. More information about the Full Groups Window is available in the section on windows. MT-NewsWatcher has the ability to fetch and store user group lists on a remote server, so that you can access the same lists from multiple machines. This is described in more detail in the Sharing Newsrc Files chapter. However, with multiple servers, it becomes necessary to specify which server to use when you open a user group list from a remote machine. The dialog used to fetch remote user group lists has a server popup which allows you to specify which server to use with that list. 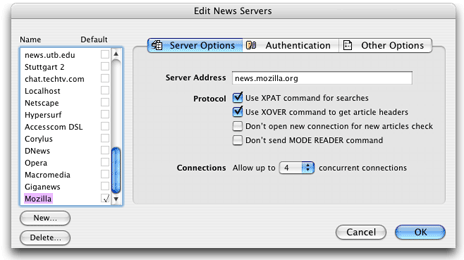 Because MT-NewsWatcher can connect to multiple servers, it can handle news URLs which specify the news server to use, for example news://news.mozilla.org/netscape.public.mozilla.mac. If the server specified does not exist in your list of servers, MT-NewsWatcher will create a server temporarily and use it. This server is then deleted when you quit the program. However, if you visit the news servers dialog before quitting, then the server will get saved, and thenceforth appear in your list of servers. Information about the default server is stored in the preferences file, and its full groups list is stored in the data fork of the preferences file. For each additional server, a file is created called "Groups for <server name>" in the same folder as the preferences folder, and the full groups list for that server stored there. The various server settings are stored in that same file. This is the server groups file. If you copy your preferences file and server groups files to another machine, MT-NewsWatcher may not be able to locate the files for additional servers. In this situation, you can use Open in the File menu to reassociate the groups file with the preferences. Simply choose the server groups file in the Open dialog box, and MT-NewsWatcher will create the server specified by that file.